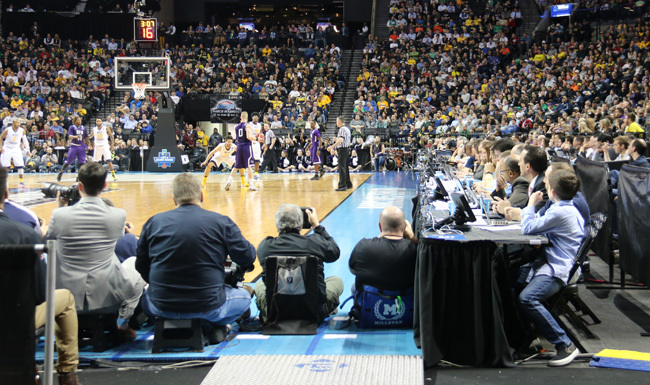 For my first assignment as a Kid Reporter, I had the opportunity to cover one of the greatest weekends in sports: the opening rounds of the NCAA men’s basketball tournament. On Friday at the Barclays Center in Brooklyn, New York, I saw four games: Villanova vs. UNC-Asheville, Iowa vs. Temple, West Virginia vs. Stephen F. Austin, and, finally, Notre Dame vs. Michigan. The teams played their hearts out. In the next round, Villanova beat Iowa and Notre Dame beat Stephen F. Austin to advance to the Sweet 16. Stephen F. Austin’s star Thomas Walkup may or may not be related to Notre Dame’s leprechaun mascot. When I spoke to the Notre Dame mascot, he told me it was not the first time he had heard that he and Thomas Walkup bear a striking resemblance to each other. Walkup told me that he had been working on his beard since November. Walkup may be more Lumberjack than leprechaun, but after this weekend, it is clear that Thomas Walkup is almost superhuman. Even though Stephen F. Austin did not advance to the Sweet 16, college basketball fans won’t soon forget the Lumberjacks or Walkup. Despite SFA’s loss, if there were MVP honors handed out in Brooklyn, I would have nominated Walkup. He had 54 points (he made 26 of 27 free throws), 14 rebounds, nine assists, and four steals over the two games. Kid Reporter Catches the Notre Dame Leprechaun! Some of these players wear really big shoes! 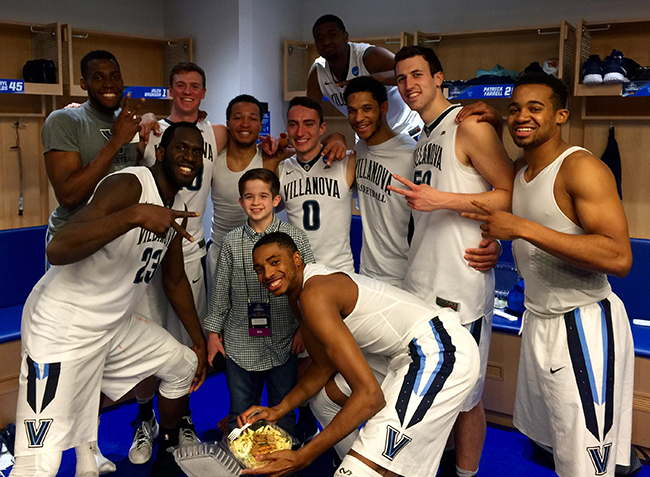 I interviewed Villanova’s Daniel Ochefu after his team’s wins over UNC- Asheville and Iowa. 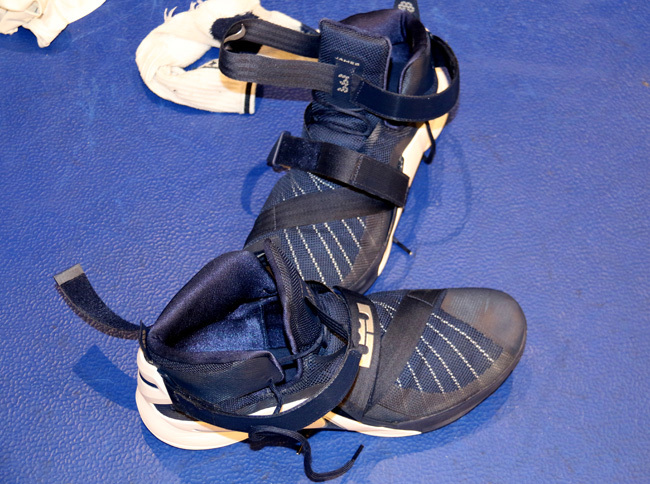 Yes, he is a 6’ 11”, 245-pound senior center, but I was a bit surprised when I saw his size 18 LeBron’s! It’s going to be tough for Villanova to fill his shoes next year, as I believe he is one of the most talented big men in the NCAA. He has a fun personality and an even better sense of humor, and he also led the Wildcats in rebounds this season (7.8 per game). The level of physical play in these games was intense, and the players were really tough. After the games, I visited the locker rooms to interview players, and the number of ice packs, bruises, and cuts surprised me. When it’s win-or-go-home, the stakes are high. These were rough games with brutal physical contact, and the players gave it their all. After leading Villanova with 19 points in the team’s win over Iowa, Josh Hart was smiling despite the enormous goose egg on his head and a noticeable limp from a toe injury. He told me he got hit hard going up for a rebound but did not seemed concerned. Hart laughed off the injuries and just spoke about how happy he was to win. I learned how to ask a question at a press conference. Me: Coach, it was a heartbreaking loss, but your upperclassmen stepped up — how do you feel about them? Coach Dunphy: I feel great about them, just like I feel great about you, Max. You’re a cool kid. And the fact that you asked your question the way you asked — I love these guys. The seniors are gone. You won’t see much of them after this. They’ll work at it, some of them trying to be professional basketball players. Some of them will be professional in some other way. So, it hurts, to be honest with you. That’s part of the problem of this situation. It’s how the abruptness of the ending is frightening, to be honest with you. But thank you for the question, Max. Social media can help document a once-in-a-lifetime experience. Instagram, Twitter, Snapchat, Facebook, YouTube — whatever you use, social media platforms have changed the way you experience a live sporting event. As a reporter, you can instantaneously share experiences with your audience. As a fan, you hope for behind-the-scenes access and a peek into the real lives of athletes. In the locker room and after the games, I noticed that the players were all using social media on their cell phones and were having fun with it, and SI Kids posted my pictures as I sent them. I was able to absorb a great deal during my time in Brooklyn, and I acquired new reporting skills through my interactions with players, coaches, and media professionals. The NCAA tournament continues: Villanova will play Miami on Thursday, and Notre Dame will face Wisconsin on Friday. As for me, I can’t wait to take on the next assignment!